Since my knitter friend Adelaide wants to go, I have an excuse to make Dave take me to Rhinebeck. Usually it's a thing where the kids' mom goes, so we have the kids and it seems insane to try to Rhinebeck with them along. (Unless the reports are exaggerated? Maybe? Please?) But! With a friend in tow who will pay for her free ride and lodgings with child care assistance (whether she knows it or not), it seems like it might just be doable. Worth trying anyway. So since I imagine future posts will be about my Rhinebeck De-virginification, I should really write about what I've been doing in the meantime. 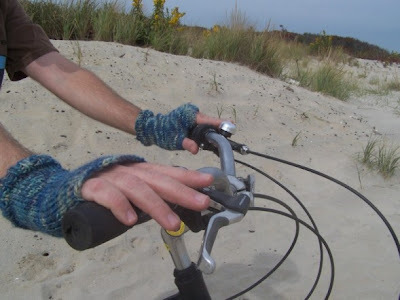 I started Dashing for Toaster, but quickly came to the conclusion that elbow-length fingerless gloves are perhaps a little excessive for an 11-year-old. 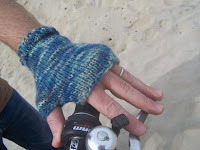 So I made up a pair for him, known as Toast, inspired by a pair I saw at The Stockinette. 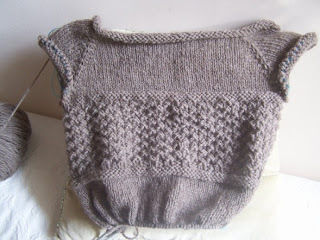 I've also been working on Fitted Knits' Textured Tunic. Knit in Cascade Ecological--which I love. So smelly, kind of like cedar almost, and comfy and rustic. I wish I were done with this already--so perfect for a sheep and wool festival. Then again, it is remarkably fast. Size 10 needles make for product knitting, yes indeed. 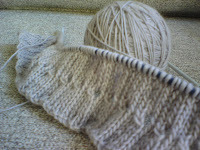 So, in anticipation of finishing the Fitted Tunic, I cast on for Molly Ringwald, using Punta del Este Mericash. Loooooove. So unbelieveably soft, but somehow a little less sticky, and a tiny bit bulkier than Malabrigo Lace, though that's the closest comparison I can think of. Looooooove. If anybody is wondering what the hell I'm doing sitting on Cobblestone while casting on for all of these, and hey, didn't I have a bunch of Christmas presents I was working on--to you I say Pssh. I'm well on my way with the Christmas list, and it's only October, and I've recently discovered that knitting things for myself prevents me from shopping for clothes, which is killing two birds with one stone and so technically almost frugal, and as for Cobblestone--it's a Christmas present. Every year I make Dave a sweater, I finish it with time to spare, I make him try it on, and then I take it away from him. It's mean. So it's going to sit there, unfinished, and I'm going to sew it up on the plane. That's the plan.